In the Okanagan’s early days, many town sites began on the shoreline of the lakes, and depended on those liquid transportation routes for their supplies, growth, and livelihood. Summerland was one of those towns. But while some towns had plenty of flat land on which to spread out, early Summerland was hemmed in by the tall clay cliffs that rose up steeply behind the narrow strip of beach. So it wasn’t long before the town fathers saw fit to relocate the main town site to the bench lands above. 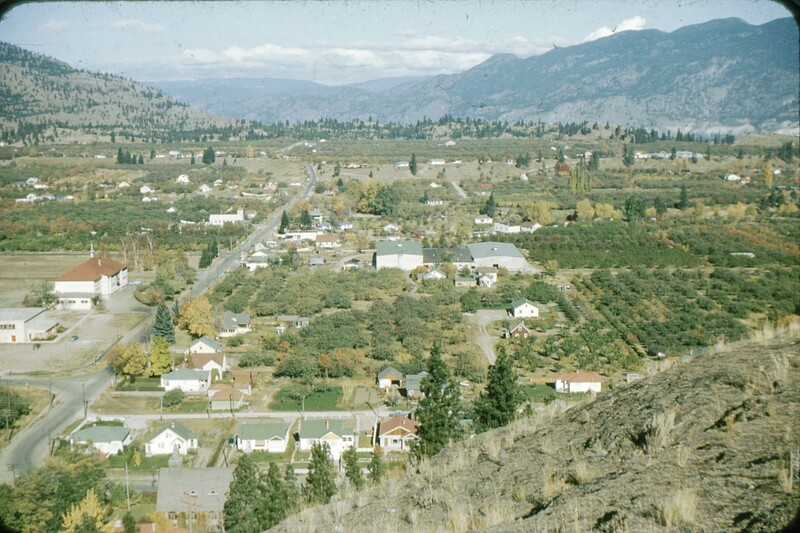 Here the town grew, as did the many orchards that spread out in every direction, thriving in Summerland’s sunny summer climate and rich soils. There was one direction where the spreading orchards came to a halt. On the south-west edge of the flats sat the Giant’s Head. This massive chunk of rock rose up impressively from the surrounding lands, its profile gazing sternly down on the lands around it. With great vertical drops on its southern side, and rocky inclines on its other sides, even the enthusiastic orchardists were halted, though they hemmed the giant in all around. If the Giant’s Head could not be tamed and turned to agrarian purposes, the two-legged ant-like creatures who scurried around below were still drawn to scale his rough-hewn features, despite his forbidding glare. Like the Lilliputians who bound and climbed onto Gulliver, the Summerland folks struck out to conquer the heights of the Giant’s Head. My mom’s family, the Motts, lived on the hillsides between Lower Town and the West Summerland town site, and many are the stories mom told us of long walks up town each day in snowy winter weather for school and church, and quick runs downhill in summer to cool off at the beach after long days working in the orchard. Many, also, were the tales of hikes up the Giant. By the time my siblings and I were spending many happy childhood days at our grandparents’ home, we had ready access to car transportation. Yet we thought nothing of walking the long road up town to mosey around in the 5 Cent to a Dollar Store, or alternately to run down the hill, by road or on the clay cliff trails, to swim in the lake. But what drew us most was the hulking Head of the Giant. There was nothing more exciting than an afternoon spent climbing up to the top of his head. From that vantage point, we could join the Giant himself in gazing up and down the beautiful Okanagan Valley, and across the peaks of the mountain ranges that stretched out beyond. Usually we would trek up Giant’s Head Mountain with a group of family and friends of all ages, and at the top we would spread out a picnic on blankets. 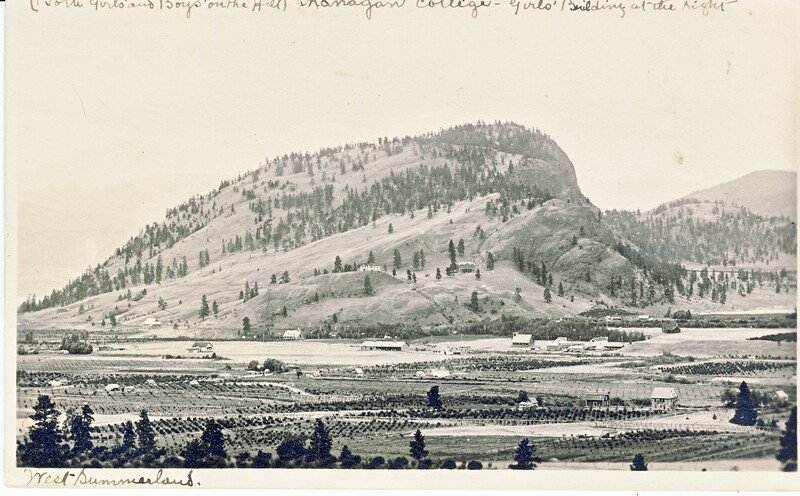 Group hikes ending in picnics on beaches, hilltops, or at the Experimental Farm were a Summerland tradition. In 1967, in honor of Canada’s Centennial, the town of Summerland created a park on Giant’s Head Mountain. Today you can drive most of the way to the top, though you’ll still have a short hike to the very peak. But there is still nothing like gathering family and friends, packing a picnic lunch, and hiking together from the Giant’s shoulders all the way up to the old fellow’s pate.